Cold rain and icy winds showed participants at the 7th annual Lifewise Big Sleepout what it means to be homeless. 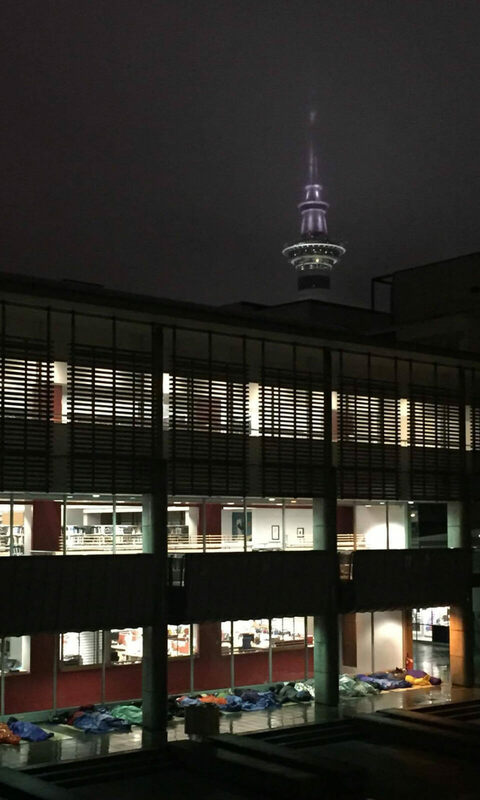 On the night of 7 July, AUT’s quad was home to 135 people for the night, at the 7th annual Lifewise Big Sleepout. Business, community and political leaders received an insight into what it means to sleep rough, rewarded by donations from friends and family and raising funds to further Lifewise’s work in ending homelessness. Having supported 113 people into housing in the year since the 2015 Big Sleepout, Lifewise are currently working with over 150 people in Auckland, aiming to get them into permanent housing and support them to live independently. However, they recognise that supporting this group alone won’t solve the issue. “Homelessness is complex, and the solution requires a collaborative approach over a sustained period of time, with government, business and community all playing their part,” says Moira Lawler, Lifewise’s Chief Executive. With homelessness rising, the demand for Lifewise’s services is growing, with an average of two new people make contact with Lifewise’s team every week. The evening proved to be informative and thought-provoking, as participants were encouraged to think creatively and break down pre-conceived notions of what is an extremely complex issue. Having slept rough for over a year, Rob managed to secure an apartment in Auckland Central, where he has been living since 2013. Now in a position to help others in similar situations, Rob works with Lifewise and its partner organisations on a project group to implement the Housing First model in Auckland. Housing First, based on the belief that housing is a basic human right, has been hugely successful in the USA, Canada, across Europe and in Australia. The approach is simple; if you are sleeping rough, you need somewhere safe to live before anything else. Once you have a home, then you can make the best use of what support is available, such as health, counselling, and financial services. Participants braved the rain and received an insight into Housing First’s Canadian founder Dr. Sam Tsemberis, the model’s Canadian founder, who delivered a video discussing the benefits of the model to New Zealand’s rough sleeping community. Lifewise would like to acknowledge the commitment of their sponsors, including AUT, with whom they have an ongoing relationship. “Homelessness is a downward spiral of devastation,” says Sarah Trotman, Director of Business Relations at AUT’s Business School. Sarah was on the steering group that established the Big Sleepout in 2010, and has continued to support the project each year since, currently sitting as the second highest fundraiser. “Next time you see someone sleeping rough, give them a smile and encourage the same community spirit in your children too,” she says. Donations to the Lifewise Big Sleepout will remain open until 5pm, Thursday 14 July. By donating, you’ll be helping solve homelessness in an empowering and sustainable manner. Donate today at bigsleepout.org.nz/content/donate.